Located in the center of the Old World, Istanbul is one of the world's great cities famous for its historical monuments and magnificent scenic beauties. It is the only city in the world which spreads over two continents: it lies at a point where Asia and Europe are separated by a narrow strait - the Bosphorus. Istanbul has a history of over 2,500 years, and ever since its establishment on this strategic junction of lands and seas, the city has been a crucial trade center. The historic city of Istanbul is situated on a peninsula flanked on three sides by the Sea of Marmara, the Bosphorus and the Golden Horn. It has been the capital of three great empires, the Roman, Byzantine and Ottoman empires, and for more than 1,600 years over 120 emperors and sultans ruled the world from here. No other city in the world can claim such a distinction. During its development, the city was enlarged four times, each time the city walls being rebuilt further to the west. Surrounded by 5th century Roman city walls and stretching over seven hills, Istanbul is adorned by the masterpieces of Turkish art, the great mosques of the Sultans that crown the hills. The city presents an exquisite, majestic and serene silhouette from all directions. 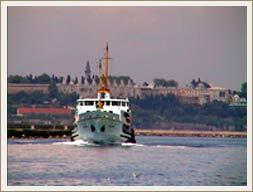 The Golden Horn, which is a very secure natural harbor, has played a significant role in the development of the city. Fortune provided such advantages to Istanbul as a location at a junction where the main overland routes reach the sea, an easily defensible peninsula, an ideal climate, a rich and generous nature, control of the strategic Bosphorus, and a central geographical position in the ancient world. As a capital of empires, the city was not only an administrative, but also a religious center. The Patriarchate of Eastern Christians has been headquartered here since its establishment, and the largest early churches and monasteries of the Christian world rose in this city on top of the pagan temples. Within a century after the city was conquered, it was enriched with mosques, palaces, schools, baths and other architectural monuments that gave it a Turkish character, while some of the existing churches in ruins were repaired, altered and converted into mosques.Between the 16th century when the Ottoman sultans acquired themselves the title of the "Caliph of Islam" and 1924, the first year of the Republic, Istanbul was also the headquarters of the Caliphate. More Jews settled in Istanbul than any other port, and here they built themselves a new and happy life after they were rescued from Spain by the Turks in the 15th century. Istanbul has always been a city of tolerance where mosques, churches and synagogues existed side by side. The city was adorned with a large number of dazzling and impressive works even during the period of decline of the Ottomans. 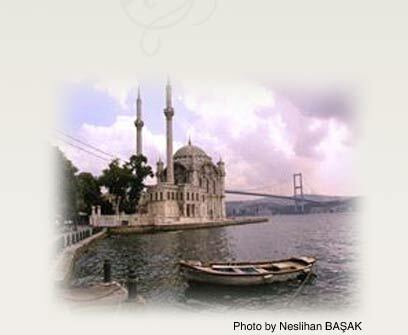 The historic city of Istanbul forms a unified whole with the Bosphorus and the Golden Horn. Nowhere else can one find the wonders of nature, human artifacts, the testimony of the past and the bustle of everyday life in such close relationship. For those who will remain briefly in the city, there are day tours including the important historical sites, museums, the famous Covered Bazaar and its vicinity. These tours leave from the hotels or the port and visit the masterpieces on the historical promontory in half-day programs. The important sites are the Hagia Sophia, one of Galata Tower from which one can see the best view of the city; the Dolmabahce Palace on the Bosphorus, the richest palace in the world; the famous Archeological Museums; the Turkish and Islamic Art Museum; the Spice Bazaar, and many other historical sites. The performances of belly dancers and folk dancers add color to night tours. The air and seaports of Istanbul are located on the European side. For those who have never stepped on Asian soil before, a boat trip or the bridges over the Bosphorus offer a wonderful opportunity. Over the suspension bridges and from Great Camhca Hill on the Asian side, one can get a bird's eye view of the city and the Bosphorus.The Princes' Islands, one hour by ferryboat and the eight wonders of the world, the Suleymaniye Mosque, Sultan Ahmet Mosque, the Hippodrome and the Topkapi Palace Museum. This is the classical one-day tour, but there are many specialized tours for Roman, Byzantine and Turkish monuments, the Bosphorus or the Asian shores, which will make the visitor return to his country with unforgettable memories. Minimums of three or four days are necessary to really get to know Istanbul. These should include a visit to the Roman city walls; the well-known Kariye Museum decorated with late Byzantine frescoes and mosaics; half an hour by catamarans from the city center, are ideal places for relaxation, recreation, hiking, swimming or phaeton tours. In addition to the city tours offered by travel agencies, luxury limousine services are also available for tours. Shopping opportunities are many and varied in Istanbul. The Covered Bazaar and the well-known shops at its entrance, Akmerkez, Galeria, Capitol and similar malls, the designer boutiques in Beyoglu and Nisantasi, and the stores on Bagdat Avenue are open the whole year. The first of the seven hills on the promontory has been the most important and dynamic part of the city in all ages. When the city was first founded, the acropolis was a typical Mediterranean trading center surrounded by city walls. This trading center was enlarged and rebuilt during Roman times. 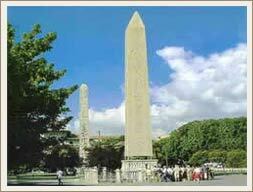 The most prominent buildings and monuments of the Roman era were built in the vicinity of the Hippodrome. Very few relics of these works have endured to the present day. The imperial palace, known as the "Great Palace", used to spread over an area extending from the Hippodrome down to the seashore. Only the mosaic floor panel of a large hall remains from this palace today. The Augusteion, the most important square of the city, used to be here, and between the square and the main avenue there was the Millairium victory arch. The road used to extend as far as Rome and the stone marking the first kilometer was located here. The baths, temples, religious, cultural, administrative and social centers were all in this district. The area maintained its importance in the Byzantine and Turkish eras. Therefore some of the most important monuments of Istanbul such as the Hagia Sophia, Sultan Ahmet Mosque, the Museum of Turkish and Islamic Art and the Basilica Cistern are all located around the Hippodrome. Hagia Sophia, which is considered as one of the eight wonders of the world, also occupies a prominent place in the history of art and architecture. It is one of the rare works of this size and age that has survived to our day. 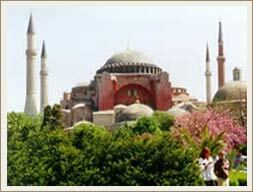 The church (called Ayasofya in Turkish) is erroneously known as Saint Sophia in the west. The basilica was not dedicated to a saint named Sophia, but to Divine Wisdom. This was the site of a pagan temple, and the three separate basilicas built here in different times were all called by the same name. Although no churches were built during the reign of Constantine the Great, some sources maintain that the first Hagia Sophia basilica was built by him. Actually, the first small basilica with a wooden roof was constructed in the second half of the 4th century by Constantinius, the son of Constantine the Great. Following the conquest of the city in 1453, the young Sultan Mehmet moved the capital of the empire to Istanbul, His first palace was located in the middle of the town. The second palace, which he built in the 1470's, was initially called the New Palace, but in recent times it came to be known as the Topkapi Palace. 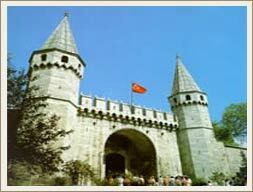 Topkapi is a classical example of Turkish palace architecture. It consists of tree- shaded courtyards, each serving a different purpose and opening onto one another with monumental gates. The courtyards are surrounded by functional buildings. From the time of its construction, the palace developed constantly with alterations and additions made by each sultan.